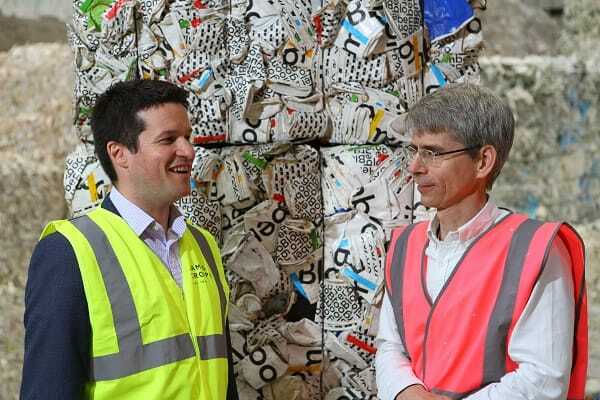 KENDAL, Cumbria, UK – The first bales of used coffee cups from a pioneering pilot scheme in collaboration with Forge Recycling, environmental charity Hubbub and Leeds City Council, have been delivered to the James Cropper Paper Mill. The delivery marks a significant step in Cropper’s ambition to help recycle some of the estimated three billion take-away cups that are currently thrown away in the UK each year. Through their unique  CupCycling™ technology – the world’s first process dedicated to upcycling disposable coffee cups – the James Cropper mill has the capacity to upcycle 500 million used coffee cups. Forge Recycling has collected almost 200,000 single-use coffee cups – from workplaces, coffee shops, universities, shopping centres and on street cup bins – since launching on 18th October 2018 and 25th January 2019. Instead of the cups going to waste they have been delivered to their mill for upcycling. With the help of James Cropper, all 200,000 cups collected will be given a second life as beautiful papers and packaging. The delivery will make its way through the CupCycling facility – which launched in September 2017 – and has already upcycled over 30 million disposable cups. A host of major brands, such as such Asda, Coca-Cola GB, Costa Coffee, McDonald’s, Pret a Manger, Starbucks and Shell, have joined Hubbub’s #LeedsByExample initiative to date. While the trial in Leeds ends in March 2019, Forge Waste & Recycling estimate that the number of coffee cups it could deliver to James Cropper in one year from Leeds alone could exceed one million – a fantastic example of the circular economy in action. “It’s not widely understood by consumers that coffee cups have to be recycled via a different waste stream, which is why we focus on developing infrastructure and communications in cities that make it easier for people to recycle properly while on-the-go.